Sport Gels Can Improve Marathon Times? Home › BLOG › Sport Gels Can Improve Marathon Times? 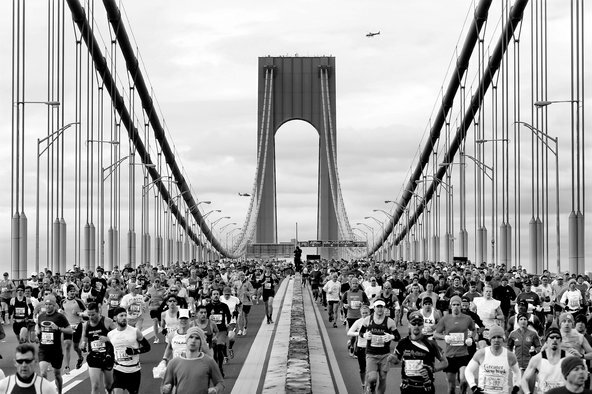 A recent study published by the New York Times shows that taking sports gels at specific times during the marathon can enhance and improve finish times! Click HERE for the entire article. Many runners in Sunday’s New York City Marathon may be overlooking a simple way to improve their finishing time, according to a new study of marathon nutrition. The study finds that consuming the right number of sports gels at the right moments during the race could help average runners achieve better-than-average results. No one should be surprised to learn that what and when a marathoner eats will affect how well he or she runs. Decades ago, physiologists established that runners who consumed plenty of carbohydrates in the week or so before a race were less likely to become severely fatigued during the grueling event. But the subsequent vogue for carbo-loading by downing large bowls of pasta for days before a marathon has cooled, as newer science and practical experience have shown that carbo-loading can result in short-term weight gain and gastrointestinal distress during the race. Instead, the best recent studies suggest that eating a carbohydrate-rich diet on the day just before the race but not earlier can be beneficial for marathoners. Few recent studies, however, had systematically examined how best to fuel during the race itself, and those studies typically had concentrated on elite finishers, not slower, recreational runners. So, for the new study, which was presented at the International Society of Sports Nutrition Conference in Colorado Springs, scientists at Aalborg University in Denmark turned to 28 local runners who were training for the Copenhagen marathon and asked them about their aspirations for the race, as well as their past running history, including how they previously had fueled and hydrated during races. The runners, male and female, most in their mid-30s, were experienced but not elite runners. In general, they expected to finish the marathon in a time between three-and-a-half and four hours, they told the scientists. To more objectively determine their speed and likely finishing times, the scientists asked each runner to complete a 10-kilometer (6.2 mile) race seven weeks before the marathon. Afterward, they numerically paired racers whose times were equivalent, linking the two fastest runners, two slowest, and so on. Then they divided those pairs, randomly assigning a runner from each unit to one of two groups. The runners in one group were told to fuel and hydrate during the marathon however they chose. The scientists offered them no advice. They had no such reticence with the second group of runners. These racers were provided with clear, specific directives about how and when to eat and drink during the marathon in order to “avoid dehydration — and overhydration — and depletion of glycogen,” which is the body’s main fuel during exercise, said Ernst Hansen, an associate professor in the department of health science and technology at Aalborg University, who led the study. The specific instructions required each runner to consume two sports-gel packets and a glass or two of water 15 or 20 minutes before the start of the race. Each gel packet contained 20 grams, or about 4 teaspoons, of carbohydrates in the form of maltodextrin and glucose, as well as a small amount of sodium and caffeine. The runners were directed to consume another packet 40 minutes into the race and another every 20 minutes from then on until they crossed the finish line. They were also told to drink a cup or two of water at the race’s 10 water stops, in order to stay hydrated and speed digestion of the gels. All 28 of the runners completed the marathon. Follow-up questioning by the scientists showed that those runners who had been on their own, nutritionally, consumed significantly fewer carbohydrates (or calories of any kind) during the race than the runners on the scientific program. Those racers generally finished somewhere near their hoped-for time. But the runners who followed the scientists’ plan and consumed far more carbohydrates finished about 10 minutes faster, on average, than their pace-matched pair, notably outperforming their goals in most cases. Interestingly, the scientists found no correlation between consuming more carbohydrates and experiencing greater digestive upset. Some runners in each group reported such distress. But those runners generally had a history of gastrointestinal problems while running, the scientists found. Consuming more or fewer carbohydrates did not noticeably affect how the Danish runners’ digestive tracts responded. The study’s results do not mean, of course, that all athletes signed up for Sunday’s marathon should stuff their pockets with gel packets. The Danish runners in the scientifically mandated nutrition group practiced their eating schedule during training. If you are unsure how your system might respond to so much goo or you have a history of digestive distress while running, by all means stick with your familiar and practiced nutritional routine, Dr. Hansen said. But otherwise, you might consider eating more during the race, he said, and perhaps finishing faster.